Car Trouble? We Can Help! 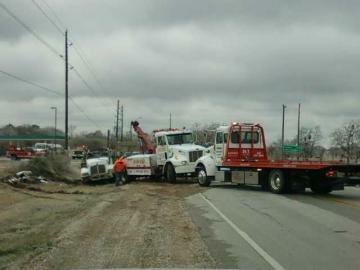 We offer fast and prompt towing and recovery services for motorists in Santa Fe, TX, Galveston County and beyond. When you call us for towing services, we will make sure that we can provide service where you are. If you are outside our service area, we will help find a service provider who can assist you. Need assistance moving something to and from point A to point B? 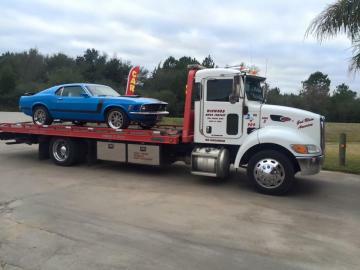 Whether it's a large shipping container or your prized retro vehicle, you can depend on Winwood Motor Co.
No matter what your make and model, we’ve got the proper know-how and equipment to successfully move it. Why Call Winwood Motor Co? We offer fast towing and transport services at competitive rates. When you call us, that's exactly what you'll get: a company providing you the service you want at the price you want to pay. When your car breaks down, count on a company like us to arrive quickly and provide the help you need effectively. We're here to help get you from Point A to Point B. We offer 24/7 towing and recovery services! We also provide local hauling and transport too.